When the Dotypos application is first run, the activation wizard will be displayed. You will need the license code to finish the activation. Please find it on the delivery note or certificate included in the package. Activation is important for the full functionality of the cash register system and to create an account in Dotypos Cloud. The license code can be used repeatedly, e.g. when activating a new cash register after claiming against the original. However, the license on the original cash register will be automatically canceled after the new activation. So 1 license code can be active just on 1 device. If you bought Dotypos together with the hardware (one of the offered Dotypos UNIVERSAL, COMPLETE or MOBILE packages), please go to this chapter. If you are activating Dotypos downloaded from Google Play, you first have to choose whether you are a new or existing customer. Use the option EXISTING CUSTOMER only if you already have credentials for Dotypos Cloud, so you have already activated Dotypos earlier. 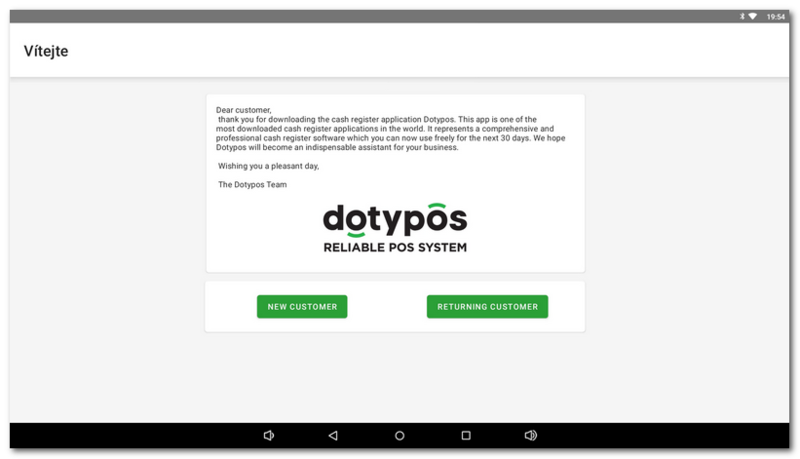 If you are working with the cash register for the first time and have not yet created an account in Dotypos Cloud, choose the option NEW CUSTOMER. Also choose this option if you want to use Dotypos in the trial mode for 30 days. See the chapter Trial version activation.